This is a 4-track EP from a quartet with a slightly unusual line-up. Pearson, a graduate of Guildhall School, plays clarinet with such a clear and vibrant tone that he often has the feel of a soprano sax. Giving his jazz and classical tuition, you get the sense that he has a classical touch and a jazz ear, seeking the syncopated and rhythmically inventive turn of phrase in each piece while also seeking a cleanness of tone. This is particularly the case in the title track (track 3) which runs for only 2’37 but packs some elegant phrases – it would be nice to hear this extended. I like the way that Stockbridge’s guitar provides both the chordal structure here and, using several tones, creates different solo voices, particularly on opening track (‘Always we can meet’) and the closer (‘Grandfather’s clock) which both begin with solid chords and then shift into simple guitar lines, repeated with different tones. This adds nuance to the quartet’s sound and gives the impression of a group with more instruments. Hints of more contemporary left-field sounds, with drum patterns brought in from R&B and hip-hop, create shuffling rhythms on the other pieces. In their description of the music here, the group suggest that there are hints of ambient in the slower passages. I felt that, as yet, the music didn’t feel confident enough to own its quietness, and so there was less willingness to stretch these into the atmospheric sounds the group is capable of making. Again, it would be good to hear longer versions of some of these pieces – or, perhaps, some of the gentler segments could be separated and developed independently. 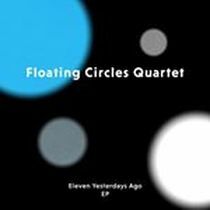 However, all in all, the quartet play with a lyrical delicacy that implies a new kind of cool.